Bradley Manning is the 24 year old American soldier accused of leaking the Iraq War Logs, the Afghan War Diary, the US State Dept Cables, the Guantánamo Files and the Collateral Murder video, all released into the public domain by Wikileaks. His mother is Welsh, and he lived in Wales as a teenager. Read more about his background here. The US Military decided on 3 February 2012 that the Court Martial of Bradley Manning will go ahead, probably within three to four months, so the beginning of May is likely. The 23 charges against him include ‘aiding the enemy’ for which the highest sentence is the Death Penalty. The Prosecution have said that they are seeking a penalty of Life without Parole. We, as members of Bradley Manning international support groups, are committed to raising public awareness. A ‘festival’ of events in Wales to highlight Bradley’s case and the issues it raises is planned for 11-28 April. All the performances will take place in schools, beginning at the school Bradley attended as a teenager: Tasker Milward high school in Haverfordwest. Booking information here. This is likely to be the last chance we have to register our visible support for Bradley Manning and to call loudly for his freedom before the Court Martial hearing against him begins. Let’s use this opportunity to raise a storm of public awareness across Wales! In the chat logs attributed to Bradley it appears that he hoped the leaks would result in worldwide discussion, debates, and reforms and we hope events in Wales will contribute to this whilst also drawing attention to the facts of his case as the Court Martial approaches and support is even more urgently needed. We want events to be as varied as the people involved – Bradley’s case and the issues it raises are a ‘conversation’ that we all need to be involved in, and this can take place through as many means as possible: music, comedy, poetry, performance, benefit gigs, presentations, visual arts, talks, discussions, debates, workshops, vigils, social events and so on. We plan to produce a touring exhibition and to organise a rally in Cardiff. If you feel able to be involved in any way, if your group can either host or organise any kind of event, or you can help individually, please email wiseupforbm@yahoo.com as soon as possible to let us know. The issues raised by Bradley’s case include war, torture, foreign policy, transparency in government, human rights, justice and legal issues, civic responsibility and whistle blowing, and gender equality (Bradley identifies LGQBT and suffered in the Army at a time when coming out was against the rules under Don’t Ask Don’t Tell). Why is Bradley Manning important to the cause of Human Rights? The material supposedly leaked by Bradley exposes US war crimes, a culture of brutality within its armed forces and a sweeping disregard for human rights across the world. It provides hard evidence of torture renditions, the murder of civilians, the torture of children and elderly men at Guantánamo, the kidnapping and torture of foreign civilians and a widespread invasion of privacy, including the spying on our own representatives at the UN. if not… then we’re doomed… as a species. This prosecution is in itself a death knell for human rights, clearly intended to deter any whistle blowers of conscience in the future. Whilst a ‘no jail-time’ plea deal is agreed for the Marine sergeant responsible for the Haditha massacre of 24 unarmed men, women and children, the US government charges the whistle blower who revealed the truth to the public with ‘aiding the enemy‘. The message sent to the world is chilling: war crimes can be committed with impunity, but exposing them is punishable by death. Human Rights bodies are being threatened, and Human Rights Legislation is being ignored. 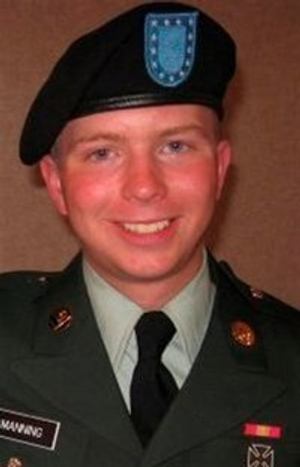 The prosecution of Bradley Manning is in itself a violation of such legislation, since whoever leaked this material against government orders should fall under the protection of the Nuremberg Principles, whereby it is not only permissible for a soldier to refuse an unlawful order, but actually his duty. Is Bradley Manning a traitor who compromised national security? No. Much of the information released, whilst being hugely embarrassing for the US authorities and hugely revealing to the public, was of low classification. None was top secret. Some was not classified at all. This includes the infamous 2007 Collateral Murder video. This shows, through the gun sight of an Apache helicopter in 2007, the gunning down of about a dozen people including two children and two Reuters journalists, none of whom are behaving in a threatening manner, by the helicopter crew, with ‘war-game’ type commentary from them. Watch it and you will see what we mean. The importance of the video is not only the horror of what it shows but also the exposure of the official lies with which the crime was covered up. The New York Times quoted Lt. Col. Scott Bleichwehl, a spokesman for the multinational forces in Baghdad, as saying: There is no question that coalition forces were clearly engaged in combat operations against a hostile force. Are Bradley Manning’s own human rights being violated? Yes. Whilst imprisoned in Quantico Marine Brig between July 2010 and April 2011, Bradley was subjected to a regime which constitutes unlawful pre-trial punishment and suffered abuses which violated both his due process and his human rights. Amongst other things he was held in conditions of solitary confinement in a cell 12’ x 6’ without a window and had no outdoor recreation, being escorted in leg irons to another room once a day for an hour of walking round in a circle. He was deprived of sleep and at times stripped naked, even for roll call. His lawyer has called his treatment flagrant violation of his constitutional rights. For more than a year the US government has prevented Juan Mendez, the UN Special Rapporteur on Torture, from conducting an unimpeded private interview with Bradley in order to ask him about the conditions under which he was held at Quantico. The abuses continue with the travesty of justice that constituted his pre-trial hearing in December. Of the 48 witnesses called for by the Defence, the Investigating Officer initially permitted only ten, all of whom had also been called for by the Prosecution. A further two were finally allowed, but the Investigating Officer deemed the others to be ‘not relevant’ and said they would only serve to distract from the relevant issues. The Prosecution was permitted all requested witnesses. The Defence continues to be denied access to witnesses able to testify to the key issues of levels of classification, lack of harm done, unlawful command influence and pre-trial treatment at Quantico. Key documents are also being withheld: ten ‘discovery requests’ for information essential to the Defence case filed from 29th Oct 2010 onwards remain unfulfilled. It was unlikely to go any other way, since this is a military trial and the Commander-in-Chief has already publicly declared Bradley Manning to be guilty. This was no other than President Obama, who spoke of the need to support whistle blowers on the campaign trail and when he came to power, but was videoed in May 2011 saying of Bradley ‘he broke the law’. The President’s statement can legitimately be taken as a possible indication that, as this is his opinion, it may also have been communicated on other occasions to people who could be influenced by it in the proceedings. Under the US military’s own rules, such a statement constitutes ‘unlawful command influence’ and precludes a free and fair trial. Nor can one be expected. The Defence contends that a plea bargain is to be sought by the Prosecution, whereby they agree to reduce Bradley’s sentence in return for incriminating Julian Assange, founder of Wikileaks, the whistle blowing site, and that this is the reason for the vastly overstated charge of ‘aiding the enemy’. It is also widely believed to be the explanation of the treatment Bradley received at Quantico. The attitude of the Investigating Officer at the pre-trial hearing is hardly surprising since he worked as a career Prosecutor for the Department of Justice, which has convened a secret Grand Jury to find a way to prosecute Julian Assange and Wikleaks. The American Civil Liberties Union (ACLU) and Amnesty International have been involved in supporting Bradley’s case, and the UN Special Rapporteur on Torture has made clear his opinion of the US government’s behaviour. The entire parliamentary group of The Movement of the Icelandic Parliament have nominated Bradley Manning for the Nobel Peace Prize. Various groups have signed open letters and registered their opposition to Bradley Manning’s situation and treatment, with more in the pipeline. Well over 250 of America’s top legal scholars signed a letter in April 2011 condemning his treatment and the Celtic league wrote to the US Ambassador in Ireland. 64 Members of the European Parliament including English, Welsh and Irish MEPs wrote to President Obama in November 2011 expressing their concerns in some detail. Various groups in Britain have taken action: Scotland Against Criminalising Communities made a statement and Cytûn: Churches Together in Wales wrote to the US Ambassador. There are currently both an Early Day Motion in the British Parliament and a Statement of Opinion in the Senedd (Welsh Assembly) which MPs and AMs can be asked to sign. There have been all sorts of public petitions including one organised by Avaaz which gained around half a million signatures in under a week, and a current petition at change.org by the Iraq Veteran Scott Olsen demanding that the UN Special Rapporteur be allowed access. Supporters here and in the US have been out campaigning at every opportunity for Bradley Manning to be freed and for all charges against him to be dropped and for Julian Assange to be free to continue the work of WikiLeaks, the whistle blowing website. Actions in solidarity with Bradley and Julian have included demos, protests, rallies, banner hangs, leafleting, public meetings, gigs, stalls, exhibitions, presentations and vigils. People have written and performed new songs, and artists and poets have been inspired to produce new work – Tim Price was inspired to write his play: The Radicalisation of Bradley Manning. You can read more about all the things that have been happening in the US on the Bradley Manning Support Network site and in Britain here on our WISE Up blog (WISE = Welsh, Irish, Scottish, English). See also this photo report and these indymedia articles [ 1 | 2 | 3 ] for a snapshot of the last year’s actions. With Bradley’s Court Martial likely almost immediately after the play finishes in Wales, we want to take this last chance to support him as visibly as possible in order to put pressure on the US government and to let him know he is not alone. We need to spread the word so that everyone knows who Bradley is and why it matters! For more information on Bradley’s case visit bradleymanning.org and the blog of David Coombs, Bradley’s military lawyer.